Why Not Compile Snow Leopard for PowerPC? Apple could borrow an idea from the MBA and solder 2 GB of RAM onto the Pro (1 GB onto the MacBook), giving the Pro a 6+ GB limit and the MacBook a 5+ GB limit. This likely lowers Apple's manufacturing costs, increases reliability (no DIMMs popping out), and increases profit potential (as some buyers pay Apple's prices for memory upgrades). Also, Microsoft is going to have a tougher time clearing its 3.x GB limit - 64-bit Vista breaks too many drivers and applications. Upgrade the Pro's optical drive to Blu-ray read/DVD write, at least on the 17 inch, with an option for Blu-ray write. Upgrade the base MacBook's optical drive to DVD write. LED backlit screens on the MacBook, at least on the high-end model. User access to the hard disk on the Pro, like the MacBook. Offer BTO upgrades up to 500 GB on the Pro (and 128 GB SSD) and up to 320 GB on the MacBook. Upgrade the iSight's resolution on the Pro, and allow a (more open) iSight BTO deletion on all models for the corporate security crowd. Add an iSight facial recognition logon feature. Add a LoJack-style theft recovery feature to all models, activated with me.com/.Mac subscriptions. Add true whole disk encryption to Mac OS X. Remote Disk (from the MBA). Beef up the MagSafe power connector. I think the MBA got it about right. Also, I wonder what Apple is going to do with the Intel Atom processors. I have a feeling that soldering RAM in place doesn't save Apple any money but is done as a space- and weight-saving measure on the MBA. It would be nice to see the Pro notebooks support 8 GB of RAM, while 4 GB should be adequate for the consumer MacBook. I wouldn't be at all surprised to see Apple offering a Blu-ray option, but I suspect the technology is too new and expensive to be a standard feature at this time. Yes, LED backlighting all around. I think that one goes without saying. I don't see much reason to give the iSight better than 1.3 MP resolution, as it's already pretty much full-screen on the 15" MacBook Pro. I enjoyed Carl Nygren's article "Safari 3.1 Is the Best Browser for Macs and for Windows". In many ways, Safari is my favorite Windows browser. Some have criticized the unusual (for Windows) font rendering, but I actually prefer it. But I still use Opera as my primary browser because it has one important feature: the ability to turn images on and off on a page by page basis. Being able to easily disable images for a page can make the difference between being able to view it or not when using a slow Internet connection. Do you know if there is any way I could achieve the same thing using Safari? Although Low End Mac has been one of my favorite web sites for years and I read it every day, I probably don't fit your usual reader profile. I haven't used a Macintosh since 1984! Thanks for writing - and for visiting Low End Mac as a non-Mac user. I didn't even touch my first Mac until 1986, and it was about 5 years before I switched. I have been impressed with Safari 3.1, Firefox 3, and Opera 9.5. I have been using Camino for years, but since Firefox 3 left beta, it's become my default browser. I don't know just why, but I prefer it to Safari, and I think that's because of Safari's brain damaged popup blocker - on or off with no site-by-site override. I can see where dialup users would love Opera, as lots of online graphics are huge. In Firefox, I have Flashblock installed, which prevents Flash-based content from automatically loading - a very nice add-on! Thank you for your response. Thanks to Low End Mac, I have learned a great deal about the Macintosh, both past and present. I work with Windows every day, so switching wouldn't be very practical, even though it sounds more appealing every day. What I like about Low End Mac is the way your readers really seem to love their Macs and want to keep using them, even though they aren't the latest and greatest. That is a far cry from the "disposable" culture that permeates computing today. It is more like the spirit I remember from the early days of microcomputing, something which I miss a great deal. Even though I can't make direct use of your website (lacking a low-end Mac myself), I enjoy it very much. Thanks for your kind words. Mac users have always been passionate about their computers, and I suspect a far greater percentage of old Macs stay out of landfills and recycling stations than Windows PCs. We develop some strange bond with our hardware and would rather have it sitting in storage than destroyed. Low End Mac's focus has always been on value: If you can use it productively and it isn't creating any bottlenecks to your productivity, keep using it. When you find a bottleneck, find the right solution - more RAM, a bigger hard drive, a different app or version of the OS (possibly even Linux), a better video card, a bigger display, or a newer computer. Note that I don't often recommend a new computer, but one newer than the one you've outgrown. That may be a used Mac, and if it is new, we like buying refurbished from Apple - full warranty but a 15% or so price reduction. I don't like disposable. Use it. Use it up. When you've outgrown it, pass it along, repurpose it, or store it as a backup. When it breaks beyond economic repair, salvage what you can and recycle the rest. And avoid buying a new Mac unless you really need a new Mac. Out of curiousity, I know that the Ubuntu guys have released a respin of Hardy with all of the updates since the original release. The version number is 8.04.1. There is a PPC version of it now (hopefully they've fixed the buggy partition manager during the installation this time around). Good luck, and thanks for writing back. Thanks for the link. I tried Kubuntu 8.04.1 yesterday with no luck, and Debian keeps failing to load the yaboot loader. I'm downloading Ubuntu 8.04.1 as I send this. It's getting a bit frustrating. I upgraded my Power Mac G4 from the original 466 MHz (7400?) to a 1530 MHz Gigadesigns 7455. I have 1.5 GB RAM installed. I use this Power Mac to encode video podcasts for a TV network I do work for. With only VisualHub running, encoding to H264 video podcast format, the Activity Monitor showed 512 MB of RAM being used by the original 466 MHz processor. Now, with the Gigadesigns 7455 processor, the Activity Monitor is showing 256 MB of RAM being used. Do you think this is because of the larger cache in the 7455 processor? I find this fascinating - My Power Mac is actually faster than I was expecting by the way. I didn't know if I'd really see three times the speed, but it's probably more than that, at least for video encoding. The 466 MHz and 533 MHz Digital Audio models were the last G4 Power Macs to use a backside cache, which usually runs at half of CPU speed. The 7455 not only has a faster cache (full CPU speed), but also a wider data path - 256 bits. Even though the 256 KB cache is a fraction of the 1 MB cache of the original CPU, it runs at about 6x the speed. No idea why an app would use 512 MB with a 466 MHz CPU but only 256 MB with a 1.5 GHz one. Maybe is uses a bigger internal data buffer when coupled with a slower CPU to avoid choking on disk I/O. In general I do not approve of flashed cards and such things but the mere fact that they exist indicate a failing market. Thanks for your email. Applemacanix has been flashing PC video cards for use on the Mac and selling them for quite a while and has 99.2% positive feedback. We've linked to him before, and this is probably a better way to buy a PCI or AGP video card than picking up a used one. I don't have any issues with flashed cards, as the buyer is paying for the hardware and using flashed software that can only run on that hardware. $40 for a flashed Radeon 7000 makes a lot more sense than $140. I'll be sure to add them with the next updates to the Power Mac G3 and G4 price trackers. Another update regarding Leopard on Beige G3 (G4 upgraded) - it's now running 10.5.4 with sound and power management functions working properly. There seemed to be a problem that whenever I updated the Beige from 10.5.0 to a newer version it would always restart with a kernel panic, stating "unable to find driver for platform "APPL,Power MacG3". The only way I could get 10.5.0 working on it was to install 10.5.0 over a working Tiger 10.4.11 installation. Using a 'fresh install' of 10.5.0, adding back relevant kernel extensions always result in the same error as above. However, thinking that the solution must lie in the kernel extensions I managed to get a fresh copy of 10.5.0 working by figuring out the differences between an installation of 10.5.0 over 10.4.11 and a fresh 10.5.0 install. By experimenting with the working installation of 10.5.0 over 10.4.11 I determined that out of the available kexts versions I have (Tiger versions, WWDC 2006 versions, and 10.5 beta-build a527 versions) that the following combination worked. Where possible I used the latest a527 versions, as these were the most recent, with the exception of AppleGracklePCI.kext, which was only available in the WWDC 2006. IOGraphicsFamily.kext from a527 exhibited the same crash as the one included in 10.5.0, so the one from WWDC 2006 was used. Installed 10.5.0 from DVD using a Digital Audio G4 to a 7.7 GB partition. *Important* used BatChmod programme to set permissions on all kexts to owner: system, group: wheel, read and execute only. Doing a permissions repair on the kexts with DiskUtility does not set the permissions properly. Booted into OS 9 and used XPostFacto to install all missing kernel extensions for the Beige and to enable booting into Mac OS X on an Old World system. Restarted and boot went well. Trying to update this to 10.5.4 resulted in the same error, so instead I used the Digital Audio to install a fresh 10.5.0 onto a partition and then ran the 10.5.4 combo updater, repeated the steps above and had success! In 10.5.4 even the internal Rage Pro works, without causing a kernel panic on startup - the key to this is to make sure that the RagePro.kext isn't in the extensions folder. Installing 10.5.0 over 10.4.11 meant that this was there. Sorry it's a bit long-winded, but hope it's of interest to all those G4 upgraded beige G3s. Thanks for all the detective work you've done - and especially for sharing it. I wonder if these same steps might not help those with G4-upgraded WallStreets and Lombards as well. The adapter/converter that Mark Arelt is looking for to make his modified webcam work did used to exist. Back when people were getting used to transitioning to the USB iMacs and still wanting to use their ADB and serial peripherals, a few companies made all-in-one converter boxes. Unfortunately even a used one probably won't help him. One was Compucable, they made two such devices. The "gDock" was actually shaped to fit the contour between the handles on the top of the blue-and-white G3 - which meant the serial ports and ADB port (and four more USB ports for good measure) faced out from the right side of the computer, while a floppy drive faced out from the left. You could even swap the floppy drive out of its bay for an ATAPI or SCSI adapter or a flash card reader. 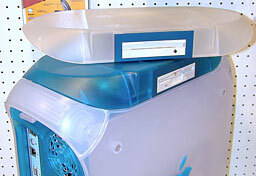 A similar product was the iDock, which was a support stand that swiveled and went underneath an iMac. As you might imagine, the problem Mr. Arelt would probably have is that I bet these boxes needed a power adapter to work. Something he wouldn't be able to get around out in the field doing moon shots. Also, the support of these devices under OS X is in doubt. I always wanted one of these, but then I got a USB Wacom Graphire tablet, eliminating the need for my ADB ArtZ tablet, and I got over the rest. Thanks for the info and the trip down memory lane. It's amazing how quickly we sometimes abandon old technology. I had to buy a USB floppy drive to read some 3.5" disks with recipes when my wife's Windows PC died and I moved here to an eMac. I've only used it once since then, and she now stores her recipes on a flash drive. 680x0 CPUs, NuBus, SCSI, floppy disks, Apple serial, ADB, Apple's DB15 video connector, PC Cards, PCI and AGP, PowerPC CPUs - I wonder what technology we'll abandon next. I worked for a TV station until spring of 2007 that was still using a Power Mac 7100-based video editing system called the TurboCube. (At this same station, as the only graphic artist, I had to make due from 1998 to 2000 with a Performa 6115 that I G3-ized myself (including dremeling out the hard drive sled to make room for a fan), and then from 2000 to 2006 with an iMac 350. Finally I got a G5.) Anyway, we once bought out CDW's supply of those Kensington one-button mice because they kept dying mysteriously after only a few months use. I have plenty more stories where those came from. ...and Apple's own AAUI connector that required a transceiver to use ethernet. But I'm trying to decide if I'm going to place my bet in the office pool on hard drives, FireWire, or LCD screens. In my opinion, AAUI is better forgotten, along with Apple's ADC video connector. Mark Arelt wrote to you about his need to convert an older Logitech/Connectix QuickCam to a USB Mac. Problem being that it connects to both the ADB and the serial ports. I'd be willing to bet that the ADB connection is used only to power the camera. If Mark can find a way of supplying a regulated +5V DC at around 500mA to the appropriate pin on the camera's ADB plug, he may find that a USB to serial converter is the only other device he needs. A simple way might be a set of four AA NiMH rechargeable batteries (4 x 1.2V = 4.8V, which should be close enough) and a female ADB plug scavenged from a dead keyboard or Mac. S-Video uses the same plugs, so he may find an electronics store with a plug to suit. Thanks for the suggestion. I've forwarded your email to Mark. Since many older Macs lack USB 2.0 but have FireWire, a FireWire video converter would be the solution for pre-USB 2.0 Macs. I've used a Canopus model and a Dazzle Hollywood DV-bridge . . . as well as analog pass-thru on a MiniDV camcorder. I've also found that B TV from www.bensoftware.com is a good viewing app. The Dazzle devices usually go for <$100 when they come up on eBay. Thanks for the tip. I don't know how old a Mac Dave Stein has, and I wasn't familiar with the Dazzle Hollywood. You have said in the Low End Mac Mailbag that "Mac OS X 10.6 will use technologies present in Intel's Core architecture that simply don't exist in PowerPC Macs". Which technologies are you referring to? And, if that is the case, why are all of the Core Solo and Core Duo Macs still supported by the Snow Leopard developer preview? Despite their name, those CPUs are based on the older P6 architecture. The Core architecture was first introduced with the Core 2 Duo CPUs. If you are talking about instruction set differences, those are handled by the compiler and not by a developer. Also, removing PowerPC code from universal binaries may save a small amount of disk space, but it does not affect performance at all on Intel Macs (they don't even execute that code unless you force an app to run under Rosetta). Maybe I'm misunderstanding things, but it sounds like Apple is involved in a lot of low-level work with technologies like Grand Central, OpenCL, and QuickTime X - the kind of optimization the original Mac design team was required to do to get System 1.0 running with 128 KB of RAM and 64 KB of machine code tweaked ROM. We're looking at an operating system that can distinguish multiple cores on one chip from multiple CPUs and allocate resources accordingly. Why go to the bother of porting that over to PowerPC when only the last generation of G5 Power Macs had dual-core processors, and only one of them had two CPUs with two cores? It also sounds like QuickTime X is being written closer to the hardware that usual to take full advantage of Intel's architecture and whatever GPU is present. Ditto for OpenCL, which will be able to offload tasks to the graphics processor (a trick Pixelmator already uses). At this level of work, it's a lot more than just telling the compiler to create code for PowerPC, and Apple may be using development tools for Snow Leopard that are optimized for x86 and don't even support PowerPC. As far as the P6 legacy goes, Yonah was a step toward the Core microarchitecture and introduced SSE3 and a Level 2 cache shared by both cores. According to the editors of the Wikipedia, Intel's Core microarchitecture "is based around an updated version of the Yonah core and could be considered the latest iteration of the Intel P6 microarchitecture, which traces its history back to the 1995 Pentium Pro." What sets Core 2 apart is 64-bit support. The thing with Intel is that there are very few giant steps between processors. There are incremental improvements, a few revolutionary changes (such as abandoning NetBurst for multiple cores), and new features here and there. P6 and Pentium M both sprang from Pentium, Core 2 is very rooted in that tradition, basically adding dual-core and quad-core support with a shared L2 cache, and the forthcoming Nehalem architecture will expand that to 8 cores. We'll know a lot more in early 2009, when Nehalem CPUs should be on the market and when Snow Leopard is getting closer to release. (Steve Jobs said "about a year" for Snow Leopard - but the last time he said that, Apple moved the timetable forward 5 month.) I think it's going to be a revelation for those with Intel-based Macs, especially the Core 2 models. And PowerPC users will still have their "plain" Leopard. Thank you for your rather lengthy reply. I really do appreciate your time and energy. I've also been exchanging some emails with Charles Moore on roughly this same subject, from a slight different perspective. As for the future, I plan in some respects to just wait and see. In other words, I do not plan on buying a new or used Mac until I feel that the dust has settled on this issue. However, I am so skeptical that I will like the situation when the next Mac OS comes out that I am already selling off some PPC Mac equipment before it drops further in value, so that I can afford some non-Mac x86 replacements that can run Linux. A used non-Mac x86 machine costs around half of what I can get for a used PPC Mac today, at a similar level of performance. I know that anything I purchase that way will be well supported by future Linux OS releases and applications for a long time to come. If I maintain one Mac and a couple supporting Linux machines, I can support fewer OS versions than what I would have to deal with in the future if I stay all Mac. The reality is, I prefer Mac for some things, but I do not need Mac OS for everything. And given a choice between Linux on old Macs and Linux on comparably priced non-Mac x86 machines, I can get greater capability at a lower cost going the second route. Just like future Mac OS releases, Linux supports x86 better than PPC. I bought Macs in the past mainly for the software, not the hardware. If I am not going to use a an old Mac OS, I really have much less use for an old Mac. In a nutshell, this means that I've chosen a path where I'll be spending no money on Mac hardware, at least in the near term, and less money on Mac software (e.g., no Family Pack) in the future than I have in the past, for the reasons I have listed. Apple sells a Family Pack for three machines. But I do not think that most Mac users can afford to buy three new Mac in less than four years. They've cut things off too quickly in the past and are planning to do it again, and I am going to plan so that I am not a victim of it next time. I find it ironic that the reason that Apple was successful in transitioning to x86 was because they intentionally choose to develop an OS that could be made to run on multiple platforms. That was because they learned a hard lesson from the 68K days that developing only for one chip could be limiting and risky. Now the reason they want to stop supporting one of them, even though G5s are not inadequate, is so that they can run on only one chip. So much for lessons learned. Every Mac ends up able to run an operating system with capabilities that the computer didn't have when it was introduced. Apple actually improves the value of older Macs every time a new version of the Mac OS is introduced that runs on them. New and updated software is introduced that runs on older Macs, further improving the capabilities of these computers. No working Mac is ever less capable than the day it was produced, and thanks to software and hardware upgrades, most become significantly more capable over time. Some see an empty glass - Snow Leopard won't support PowerPC. We see an overflowing glass - Tiger gave G3 Macs capabilities the Classic Mac OS never had, and Leopard gives G4 Macs far more capabilities than the version of Mac OS 9 or X that they came with. Rest assured that Apple is not going to kill of Leopard when Snow Leopard ships. Since the introduction of Mac OS X 10.3, Apple has continued a policy of providing security patches and similar updates for the final revision of the previous version of OS X. Expect no less with Leopard once OS X 10.6 comes to market.